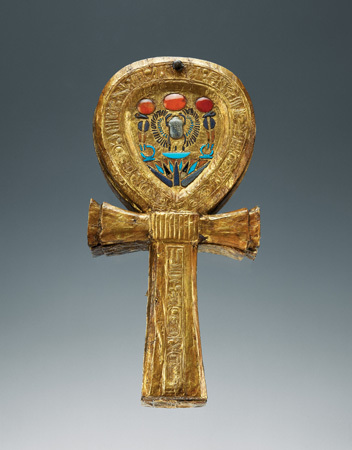 The ankh is one of the most widely recognized religious symbols in the world. Ask anyone what the ankh means, and invariably, the words, “eternal life” will be the definition that is offered even by laypersons. Even today, we often hear the ankh referred to as the Key of Life. More than this, it stands for several life-sustaining things. In some reliefs, ankhs are seen pouring out, to symbolize water and in turn purification. Other reliefs show the sustenance in the form of food or flower offerings which were referred to as ankhu. Most often, however, it is shown to represent the breath of life. Often statuary, paintings or reliefs will show a King, a Queen or other member of the noble class being presented with an ankh that is held beneath their nose by the god or goddess. 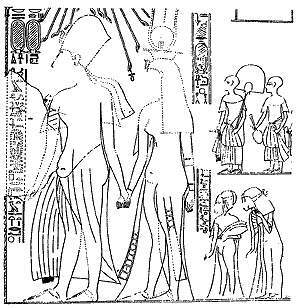 During the reign of the Heretic Pharaoh, Amunhotep IV, otherwise known as Akhenaten, reliefs of the Aten disk can be seen with streams that form long arms and hands that offer ankhs to the Akhenaten, Nefertiti and their children. During this period, the literal disk of the sun, or the Aten is what gave life to the Two Lands. Most everyone also knows that the word ankh can also mean mirror and often mirrors in ancient Egypt were made in the shape of an ankh. The ankh survives today, not just among Kemetics and Pagans who incorporate the symbol into their personal practices, but even after the fall of Ancient Egypt to Roman Rule and Roman Paganism, the natives of Egypt among the first to convert to Christianity, but the ankh survives in the form of the crux ansata, ansate, looped, or handle-shaped cross in the Coptic Church. Naydler, Jeremy. 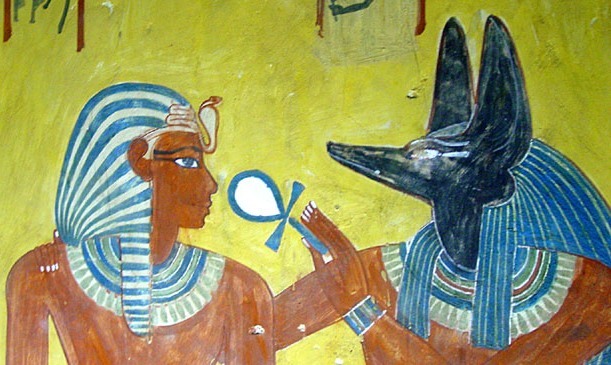 Temple of the Cosmos: The Ancient Egyptian Experience of the Sacred. Rochester, VT: Inner Traditions, 1996. Print. Naydler, Jeremy. Shamanic Wisdom in the Pyramid Texts: The Mystical Tradition of Ancient Egypt. Rochester, VT: Inner Traditions, 2005. Print. Wonderful post! Do you think Udjat is more a symbol of Kemeticism than the Ankh? I am not certain what you mean as “more of a symbol for Kemeticism” with regard to the Udjat / Eye of Horus or / Eye of Ra. The Eye is symbolic of a great deal – for me the Udjat is a protective symbol, probably more so than that of the ankh. Because the Eyes of Ra tend to specifically pertain to Goddesses: eg. Sekhmet, Hathor, Wadjet, Bast, Mut, Weret Hekau, Aset, etc. that is a very good symbol. My license plate says EYEOFRA, I have a sterling silver eye that hangs on the rearview mirror and I have an Eye on the back of the car, much like a Christian might have a fish symbol. I also have eyes everywhere in my home. However, I also have many, many other symbols in the house as well. Great. Looking forward to your post. As a new Kemetic I’ve noticed the importance of the Eye of Horus/Ra. I even drew the Eye on a piece of parchment and keep it folded in my purse for protection. Thanks for the wonderful blog. It’s been a great resource to me. As for Elizabeth Haich’s book, it was required reading when I was a Dedicant, so yes. I have read it. However, that metaphorical story should never be misconstrued as anything other than largely symbolic in nature – no matter if Haich claims that it was past life memory. Maybe so, but, much of it is tying back to the works of H.P. Blavatsky and the symbolism of the tarot – for example the taming of lions to pull a Chariot. By that same token, leonine deities are very complex. I would recommend a thorough perusal of “:Le Rôle Et Le Sens Du Lion Dans L’Égypte Ancienne” by Constant De Wit, Leiden: E.J. Brill, 1951. I do believe that you are preaching to the choir. I have very direct experience with the technology, as you say, and I have direct and deep intimation on how the language of that time / and place also works. People tend to discount symbolism, but in the context of polyvalency – it can be both true and untrue at the same time in ways that might seem on the surface to be contradictory in manner. Further, symbolism / symbology, etc. especially with the precision that the ancient people had put together – provides a vehicle toward understanding that is quite literally hidden in plain sight. Keeping that idea in mind is absolutely essential when dealing with in a language, and an underlying culture that contains with over 400 symbols, over 4000 different manifestatons pr names of God / the Divine, 17 tenses and double, triple and even quadruple entandres. . In short, you could spend your life on it, but you will never havw it entirely sussed – not even if you were raised with it from birth. That is the beauty of it. One symbol by it self, whether it is the ankh or the sekhem, the Djed or the was – for example, would keep anyone busy for a lifetime.